President Maduro also spoke of the financial and economic agreements he discussed with his Chinese counterpart Xi. Sept 18 (teleSUR) The Venezuelan President Nicolas Maduro warned that the “conspiracy” against his government “remains underway with the support of the United States”, during a press conference Tuesday less than a day after he returned from an official visit in China. Maduro said ex-military officers were conspiring against his government with the help of the United States, responding to a question about a New York Times report that U.S. officials met with military officers seeking his ouster. However, he asserted that his government is ready for respectful dialogue with the U.S. government but denied the existence of any secret talks with Washington. He also commented on the military intervention remarks made by the head of the Organization of American States Luis Almagro calling him “garbage” and saying he will be forgotten in the “dustbin of history”. 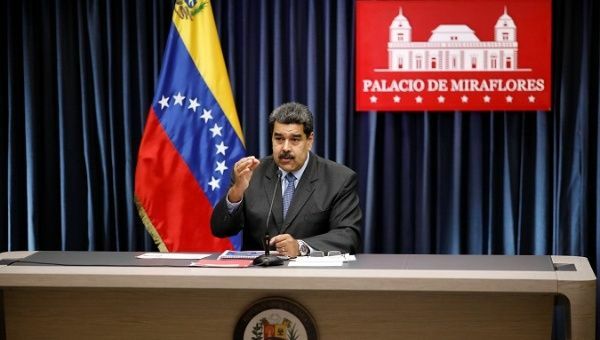 Maduro added that Venezuela and its people would be ready for any attempt on its sovereignty by those “imperialist” powers that Almagro is urging to intervene. The head of the Venezuelan state also spoke of the financial and economic agreements he discussed with his Chinese counterpart Xi. “With China we have built a strategic relationship that has gone through several stages. In the stage of large oil revenues and bonanza, with China, we moved forward on the creation of a Chinese-Venezuelan financing fund,” said the president. “In ‘lean times’ we achieved sustainable agreements from the financial and economic point of view (…) This visit initiates a new era in China-Venezuela relations in the framework that we are entering a new era of economic recovery “he said. He also told reporters he estimated they could double vital oil production within a year, under a recovery plan being advanced by the state oil company. The goal of the president is to increase crude oil pumping by one million barrels per day by August 2019. The president also announced that the executive president of the National Petroleum Corporation of China (CNPC) will visit Venezuela to finalize an oil export plan to the Asian nation. He said that a US$5 billion joint oil investment will take place with China. China will support oil production, gold, basic industries, medicine, trade, telecommunications, cultural and educational exchange, and security and defense, Maduro said.